So much for a good night’s sleep. Despite my exhaustion, I couldn’t fall asleep until after 2 a.m. last night. After not more than an hour I was woken up by hooting and hollering through the paper thin walls of the apartment next door, meaning I slept poorly and insufficiently for the fifth night in a row. My body needs a vacation from my vacation. After an orange and banana breakfast, we packed and cleaned and Ahmed dropped me off downtown before heading for Houston. The city was pretty deserted. The barricades on 6th Street had come down so had all of the outdoor stages. The throngs of rockers, hip hoppers, and hipsters had disappeared leaving mainly homeless folks, tear down crews and festival-goers leaving town. My busking options have dried up. South by Southwest is a massive and sprawling (similar to Texas in general I guess) event. Perhaps too big. Seattle’s Bumbershoot is a handful, but at least it is in one concentrated area and nothing is more than a 10 minute walk. Of course, this also means it’s smaller and fewer bands can play there. Here you really need to huff it to see all of the festival, the counter festivals, and non-SXSW venues. In my four days I have barely scratched the surface. But, but…I LOVE my stupid iPhone!barely scratched the surface. I can’t help but think what a massive carbon footprint this festival leaves. Thousands of musicians, industry folks and fans pile in from all over the globe for a few days. You figure there are at least 500,000 people on the streets for this festival drinking 5-10 beverages a day. And I only saw one of the dozens of clubs I went to (SXSJ) that had any kind of clear recycling going on. The ecological side of me really struggles with making plastic CDs, touring in a gas guzzling van, and the other environmental impacts of the music industry. 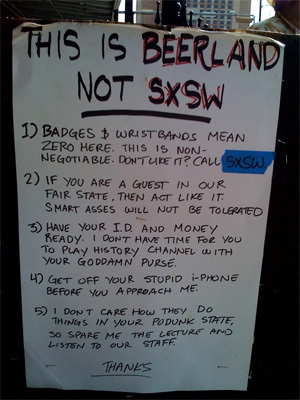 Perhaps SXSW can lead the charge on developing a greener ways to do this, just like they’ve set precedent for music festivals.